What is in office balloon sinus dilation? Balloon sinus dilation is a minimally invasive treatment for chronic or recurrent sinusitis. In a balloon sinus dilation procedure, your physician uses a small balloon to dilate or expand the sinus opening and drainage pathways to restore sinus drainage. Balloon sinus dilation can be performed in an office, under local anesthesia. How does balloon sinus dilation work to treat chronic or recurrent sinusitis? 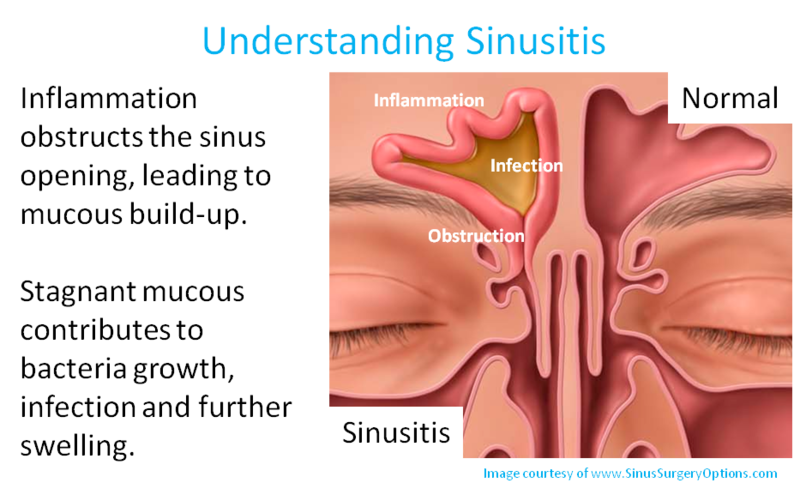 In chronic and recurrent sinusitis, blocked sinus drainage pathways can prevent effective drainage and healing. When first line medication therapies fail to resolve symptoms and inflammation, or patients experience multiple bouts of sinusitis, balloon sinus dilation may be an appropriate treatment option. The goal of balloon sinus dilation is to expand the sinus openings and drainage pathways in order to aid drainage and promote healing. After locating the treatment area and applying local anesthesia, your physician will place the small balloon, inflate the balloon to dilate the treatment area, and then deflate and remove the balloon. How long does the balloon sinus dilation procedure take? Procedure length is dependent on your specific condition and anatomy. You should expect to spend around one and a half to two hours at the office, to allow time for pretreatment preparation and post treatment examination. Consult your physician to better understand the details of your procedure. What are the benefits of an in office balloon sinus dilation procedure? Office based procedures performed under local anesthesia allow you to avoid the negative effects, costs or risks associated with general anesthesia. Balloon sinus dilation can be performed under local anesthesia, in an office. In certain circumstances, balloon sinus dilation may also be used in combination with modern sinus surgery tools. In these instances, it may be performed in an operating room, under general anesthesia. Many patients can resume normal activities immediately. Your doctor may recommend you refrain from very strenuous activities (such as heavy lifting) for a week after the treatment. Are there any potential risks and complications associated with balloon sinus dilation? As with any medical intervention, potential risks and complications exist with balloon sinus dilation. All patients should consult their doctors to determine if their conditions present any special risks. Your physician will review potential complications of balloon sinus dilation at consultation. Possible side effects include but are not limited to post-operative bleeding; pain and swelling; allergic reaction to anesthesia or other medications administered during the procedure; or infection. Your condition may not respond to this treatment. Is balloon sinus dilation suitable for everyone? Only your physician can tell you if balloon sinus dilation is a viable option to treat your sinusitis. Experience has shown that many patients with recurring or persistent sinusitis can be treated with balloon sinus dilation. For more information on balloon sinus dilation, or office based sinus treatments, visit SinusSurgeryOptions.com.